An American reality show about turning trashed houses into beautiful homes goes to a small European village and gets more than they bargained for in the found footage horror comedy THEY'RE WATCHING. 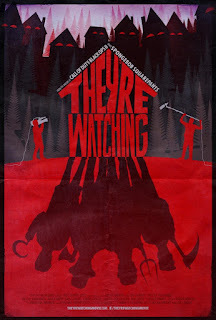 I don't know who the "they're" in the title is supposed to refer to, but as the movie wore on I found myself wishing it didn't include me. The set up should be familiar to any fan of sixties/early seventies Euro horror. It's pretty much the same old plot as Mario Bava's BLACK SUNDAY, Michael Reeves SHE CREATURE, and countless other films: centuries ago, a witch was put to death by angry townspeople. Of course, she put a curse on her persecutors and promised to return for vengeance. But as always seems to happen in these things, witchy vengeance is slow in coming. Where to begin with what's wrong with this movie? The beginning itself seems as good a place as any. The first scene of the film gives away major events from the conclusion for no good reason, ruining any suspense that might have been built. The supposed humor isn't funny. None of the characters are likeable or interesting. The film is a slow burn for most of its running time, then suddenly tries to transform itself into an over the top gore-omedy in the vein of DEAD/ALIVE or DEATHGASM. Only aside from the awkward transition and aforementioned lack of humor in the supposed funny bits, the special effects are terrible CGI that would barely pass muster in a release from The Asylum (the folks responsible for those SHARKNADO movies in case you didn't know). Usually I go into a little more detail about plot and at least name the cast and principal crew. Here I can't find it in myself to be bothered. And really, anyone involved in this waste of time should be grateful not to be named. This film had a budget of over 3 million. Not a lot by Hollywood standards, but still enough that viewers have a right to expect something decent. But I've seen backyard horror movies made by kids with a camcorder that were better written and more entertaining. The extra money bought a little polish and some better actors, but without any passion or creativity behind the scenes it's for naught. And anytime you have a movie that clocks in at a mere hour and fifteen minutes, but feels like it's never going to end, you know something has gone terribly wrong. 1 out of 4 stars.